Compromises are rare birds in the woods of the annexation and cityhood debate in DeKalb County. But there may have been a sighting during an annexation meeting held at Druid Hills High School on Thursday, Jan. 8. Numerous proposals would make most of unincorporated DeKalb County part of some city. There are proposals for allowing residents to vote on creating new cities like LaVista Hills, Tucker, the City of South DeKalb and Stonecrest. Annexation proposals from existing cities add another layer complexity. Some of the annexation maps overlap with each other and with the cityhood proposals. 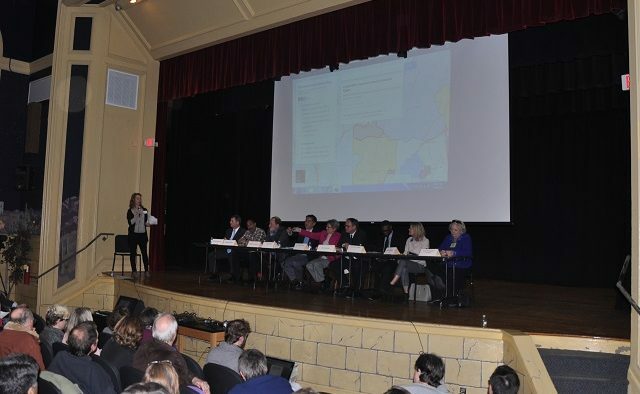 Thursday’s discussion focused on one annexation proposal from a group called Together in Atlanta. This proposal would annex Briar Vista and Fernbank Elementary Schools, as well as Druid Hills High, into the city of Atlanta. Legal precedent suggests that those schools, currently in the DeKalb County School system, would become part of Atlanta Public Schools. Parents with kids in the other elementary schools – Avondale, McLendon, and Laurel Ridge – are worried about where their children will attend high school if that happens. Representatives from DeKalb County Schools, the city of Atlanta and the DeKalb County legislative delegation attended the meeting. DeKalb County School Board Member Marshall Orson told the audience he’s been reading the state constitution recently. As it turns out, it allows for intergovernmental agreements between school districts. It would be an exchange of tax money and services that would leave attendance zones unchanged. There are no certainties in the annexation and cityhood process. All of these ideas need sponsors in the state legislature. Assuming it finds a sponsor, passes the House and Senate and the governor signs it, the voters have to approve it. 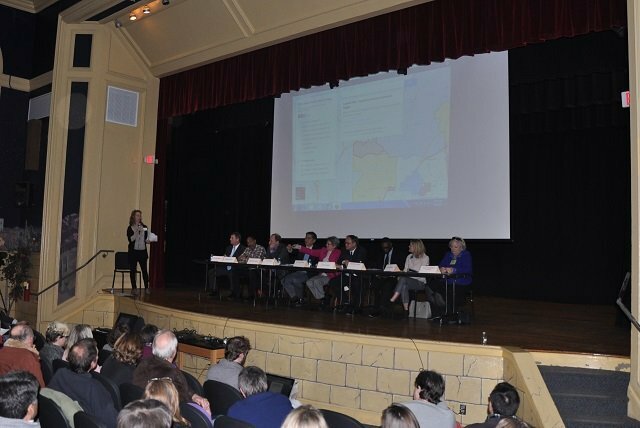 If a heated Jan. 7 meeting held at Young Israel about Together in Atlanta proposal is any gauge, the voters aren’t in the mood. But there was no talk of an intergovernmental agreement at that meeting. The crowd was more civil and listening intently on Jan. 8. Orson’s suggestion sounded similar to the sentiments of Rep. Mary Margaret Oliver, D-Decatur. She sat on the committee that settled one of the boundary disputes between the proposed cities of LaVista Hills and Tucker. Oliver hinted that there’s a way to thread the needle to keep the Druid Hills cluster intact while allowing the Atlanta annexation to move forward. Oliver used the phrase “charter cluster” throughout the evening, but that’s a different concept than simply keeping the feeder pattern intact. Parents in the schools that feed into Druid Hills High wanted to create a charter cluster. The Together in Atlanta group formed after the charter cluster proposal failed. Orson spoke only about the status quo of the schools that feed into Druid Hills High. So are there any other school districts with an intergovernmental agreement? “I think that Hall County and the city of Gainesville have an agreement,” Orson told Decaturish after the meeting. Yes indeed they do. According to AccessNorthGa.com, “Any student attending Hall County Schools but living in an area annexed by Gainesville will continue attending Hall Schools until voluntarily choosing to transfer, withdrawing or graduating.” In return, Gainesville gives Hall County the school taxes it collects on the annexed property. The way the article describes it, it’s an arrangement that works well for both school systems. To read it, click here. The intergovernmental agreement concept sounds plausible, but with the General Assembly convening on Jan. 12, is there enough time? No representatives from Atlanta Public Schools attended the Jan. 8 meeting, so APS’ position on the idea isn’t known. Rep. Oliver believes there is enough time. “I think that solutions to keeping the Druid Hills charter cluster and all the feeder schools together is absolutely achievable before the end of the session,” she said. Orson said the idea should be discussed no matter what happens in the legislature this year. It’s less contentious and cheaper than DeKalb Superintendent Michael Thurmond’s suggestion that the county schools spend millions fighting the Atlanta annexation in court. Rep. Oliver, an attorney, didn’t hide her disgust with that threat. “I’m really confused about why somebody is already choosing to litigate something that hasn’t happened instead of sitting down in a fair-minded way,” Oliver said. Confusion is more plentiful bird than compromise in these woods. Even if there is an intergovernmental agreement, and Atlanta annexation moves forward, there will still be issues to sift through. Decatur’s recently approved annexation master plan overlaps with Together in Atlanta’s. Another portion of the TIA map overlaps with LaVista Hills. Conflicts remain and there’s a seemingly limitless potential for more. But after months of circular arguing and studying the contradictions in state law, any sign of a possible solution that doesn’t leave one side empty handed is noteworthy. So take note. See more: Here are the closing statements from the Jan. 8 meeting at Druid Hills High.